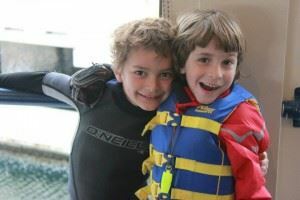 At CYC, we share a love of sailing – that is our bond. 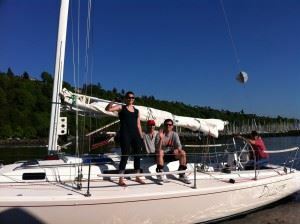 We invite you to join us and be part of a thriving sailing community. Our members enjoy each other’s company both on and off the water. 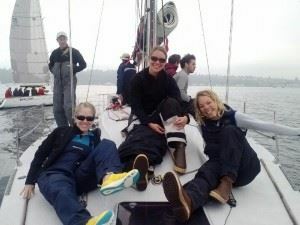 We love racing, cruising, education, junior programs and social events. The clubhouse is open every Friday from 6-10PM, and on Wednesdays and Thursdays in the summer. Come join us as our guest anytime and explore membership. We look forward to you being part of the CYC family. Join today! To become a member, we ask that you meet at least two current members who will serve as your "sponsors." If you don't already know CYC members who can serve as your sponsors, come as our guest to a Thursday or Friday social. You will meet people who can give you a sense of our community and will likely be happy to serve as your sponsor. Once you have submitted your application, consider yourself a temporary member and participate in our events. The Board meets on the Second Monday of each month and reviews applications and you will be notified when your membership becomes official. Select your Membership Level below, select NEXT and complete the application. NOTE: If you select recurring payments for your membership level the address you fill out on your application must be the same as the address that your bank/credit card issuer has on file to ensure transactions are not declined. Upon application, your credit card will be charged for your first dues period. In the event of your application is not approved, you will be refunded. Adult/Family - Age 19-24 (Annual Payments) - $132.00 (USD) Bundle (up to 5 members) Subscription period: 1 year Automatic renewal (recurring payments) By selecting this membership level you membership will be automatically processed on the due date each year. Please ensure that the address you use is the same as your billing address with the bank/credit card issuer. Ages for membership tier are considered as of January 1 of each year. Adult/Family - Age 19-24 (Monthly Payments) - $11.00 (USD) Bundle (up to 5 members) Subscription period: Monthly Automatic renewal (recurring payments) By selecting this membership level you membership will be automatically processed on the due date each monthly. Please ensure that the address you use is the same as your billing address with the bank/credit card issuer. Ages for membership tier are considered as of January 1 of each year. Adult/Family - Age 25-29 (Annual Payments) - $264.00 (USD) Bundle (up to 5 members) Subscription period: 1 year Automatic renewal (recurring payments) By selecting this membership level you membership will be automatically processed on the due date each year. Please ensure that the address you use is the same as your billing address with the bank/credit card issuer. Ages for membership tier are considered as of January 1 of each year. Adult/Family - Age 25-29 (Monthly Payments) - $22.00 (USD) Bundle (up to 5 members) Subscription period: Monthly Automatic renewal (recurring payments) By selecting this membership level you membership will be automatically processed on the due date each month. Please ensure that the address you use is the same as your billing address with the bank/credit card issuer. Ages for membership tier are considered as of January 1 of each year. Adult/Family - Age 30-69 (Annual Payments) - $462.00 (USD) Bundle (up to 10 members) Subscription period: 1 year Automatic renewal (recurring payments) By selecting this membership level you membership will be automatically processed on the due date each year. Please ensure that the address you use is the same as your billing address with the bank/credit card issuer. Ages for membership tier are considered as of January 1 of each year. Adult/Family - Age 30-69 (Monthly Payments) - $38.50 (USD) Bundle (up to 10 members) Subscription period: Monthly Automatic renewal (recurring payments) By selecting this membership level you membership will be automatically processed on the due date each month. Please ensure that the address you use is the same as your billing address with the bank/credit card issuer. Ages for membership tier are considered as of January 1 of each year. Adult/Family - Age 70+ (Annual Payments) - $264.00 (USD) Bundle (up to 5 members) Subscription period: 1 year Automatic renewal (recurring payments) Over 69 years of age. Adult/Family - Age 70+ (Monthly Payments) - $22.00 (USD) Bundle (up to 5 members) Subscription period: Monthly Automatic renewal (recurring payments) Over 69 years of age. Business - $1,650.00 (USD) Bundle (up to 10 members) Subscription period: 1 year Automatic renewal (recurring payments) Automatic sponsorship and special privileges.